We seem to be going through a dice game phase at the moment, having played several different ones over the last few weeks. One of these is the new acquisition, Dino Hunt Dice, which I actually bought partly to top up an online games order to a free shipping level. Two apatosauri and a tyrannosaurus is a good start, but two stomps already looks ominous. 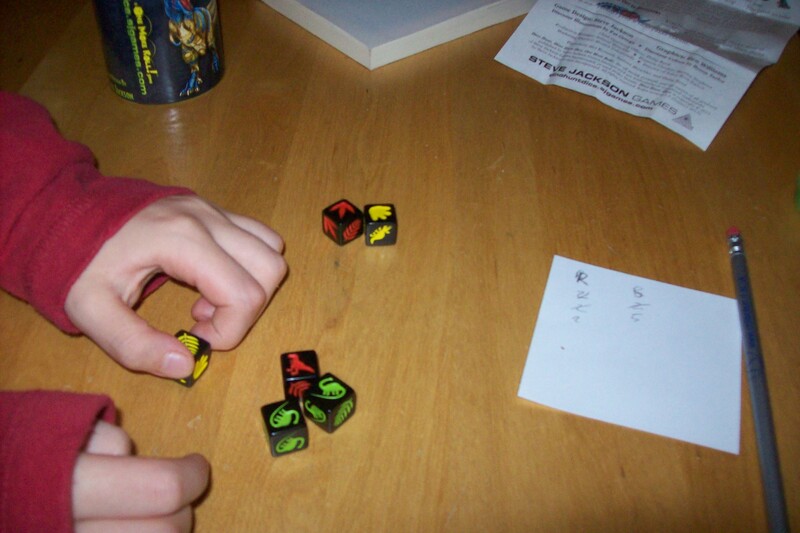 The game is actually almost identical to the better-known Zombie Dice, being a very simple, push-your-luck game where you roll three dice at a time (there are three types of dice, representing different danger levels — the T-rex die is most dangerous, while the mild mannered apatosaurus is only likely to stomp you by accident), hoping to roll dinosaurs but not stompy-feet. You accumulate the stomps and if you get three of them you score nothing and your turn is over. 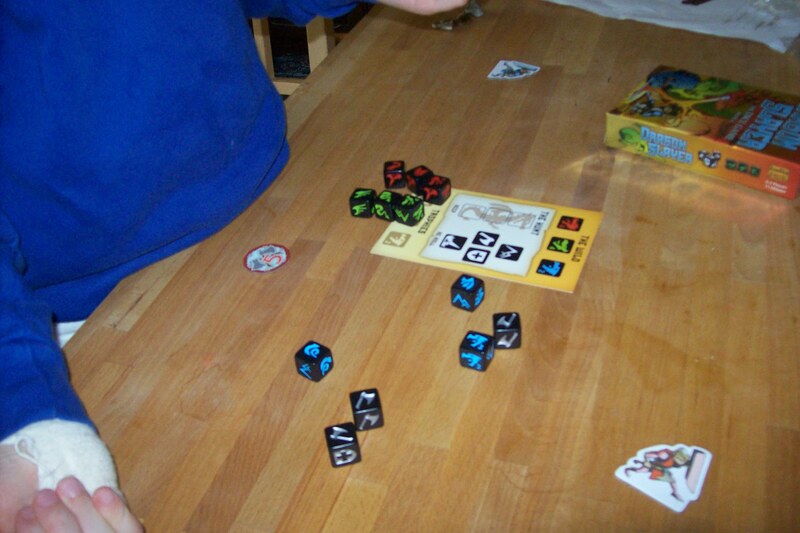 Dinosaurs score points, and after each roll you can choose whether to roll another three dice (putting aside dinos and stomps and replacing them with fresh dice) or stop and record your score. So, simple rules and dice with dinosaurs on (apart from the ones I’ve already mentioned there are tricerotops too), so what’s not to like? Miss B is getting pretty good with push-your-luck games nowadays. When things go wrong for her, she generally rolls with it rather than getting upset as she used to. I think it helps when she sees me having horrible runs of bad luck too. In our latest game I hit the end-game target score, leaving her with seven points needed to draw even, which is a tough target. She had a great spell of luck and quickly bagged six dinosaurs, which would normally be a good time to bank, but as this was her last turn she had to push on, and proceeded to make the worst possible roll, getting horribly stomped whilst within a hair’s breadth of a heroic comeback. We both groaned, then high-fived, and then moved on to something else. I’m very proud of her, especially at times like that. 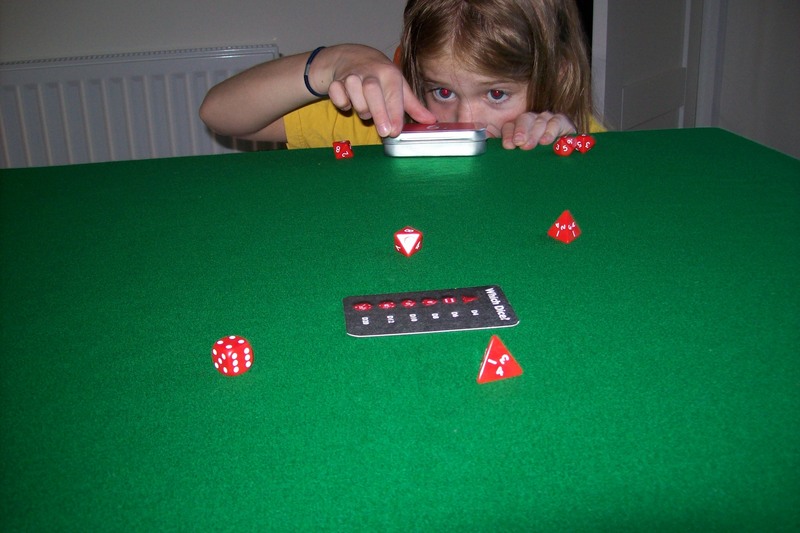 The game: Dino Hunt Dice (Steve Jackson Games), 2 to 8 players aged 6+. We have just received a package of stuff from Kickstarter projects, including a new dice game called Dragon Slayer. It has some quite groovy custom dice, and right now the combination of dragons and dice is too much for Miss B to resist, so we managed to give it a go before the packaging had reached the recycling bin. With the red and green dragons already dealt with, it looks like blue is toast as well. About these groovy dice… Well, there are four sets of them, one set including axes and shields on the faces, for attacking and defending, and the others being a set in each of red, green and blue, made up of a die for the head, wings and tail of the dragons, along with some mountain sides, which are useless. All the dice also have one or more “fire breath” sides, which you don’t want to roll unless you also get shields. These dice look great, and each colour of dragon also has its own distinct design, which is a nice touch. The idea is that you choose one of the dragons to hunt (the red is most dangerous but scores most points, while the blue is easiest but lower scoring), take the three corresponding dice and roll them with your own warrior dice. The aim is to roll all three parts of the dragon plus an axe with which to slay it. If you roll more fire breath faces than shields, you lose some of your warrior dice, and then you get a chance to reroll any dice that aren’t dragon parts or lost. If you complete the required set, you get the option to either score up your kills or try hunting another dragon (without any dice you lost in the fires). Oh, and each player has one “challenge” token, which they can play to force another player to push on when they were wanting to stop. 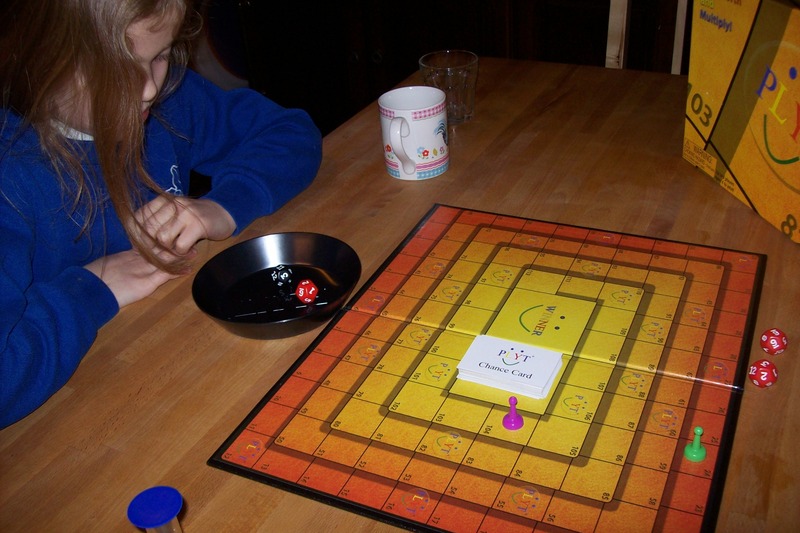 The challenged player can refuse and score reduced points for the round, or accept and get extra points if successful. The challenger gets points if the challenge is refused or failed. That’s it. The game is played up to 40 points, may the best dragon hunter win! We haven’t really played this enough yet for me to get a real feel for it, but I do quite like it so far, plus the game has a very different feel to the other dice games we have, which is definitely in its favour. That, plus the lovely dragony dice has really won me over, despite the fact that luck of the dice can make for enormous swings in the game — we have had a couple of rounds where one of us just wipes out instantly by rolling a vast quantity of fire attacks, and several others where a dragon is simply defeated with the first roll. Playing with adults, the challenge tokens would be far more of a thing than they were for us, and would add a nice extra layer onto the game, but it’s still going to be mostly about rolling lovely dice. What matters, though, is what Miss B thought. As always, we finish with her thoughts, but as we were playing she said that she hoped we would tie at the end because the tie-breaker is to play another round, and she wanted to keep playing. 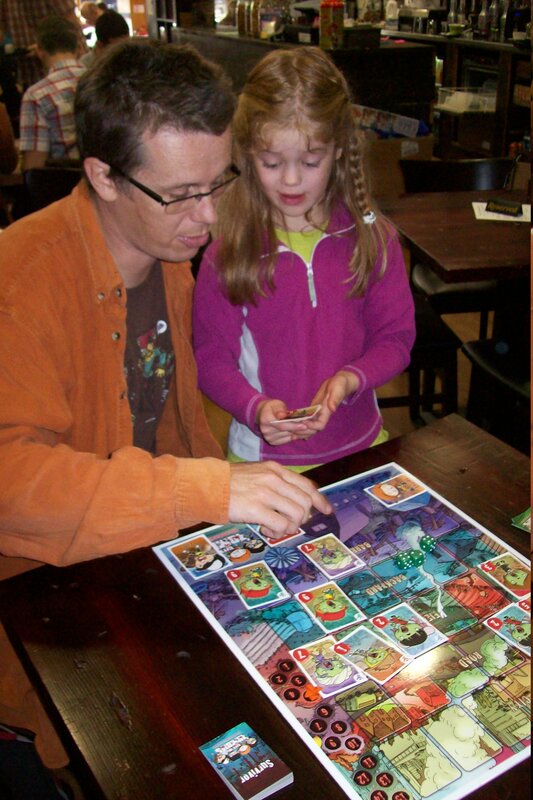 The game: Dragon Slayer (Indie Boards & Cards), 2 to 6 players aged 14+. A few days ago we received our Kickstarted copy of Flippin’ Fruit, a cute little dice game with the lovely gimmick of having cute anthropomorphised fruit depicted on the sides of a bunch of twelve-sided dice. When I saw pictures of the early mock-ups in a thread on BoardGameGeek, I have to admit that this was a case of me yelling “where do I send my money? !” at the computer. Luckily, the designer went on to run a Kickstarter project, which was successfully funded, and ended up delivering the product within a month of its expected date which, if you are used to Kickstarter, is a pretty impressive feat. Even more luckily, the game is pretty good. I’ll admit that I would have loved to see the dice being a little larger, but they are great as they are, and given the price and that this is a guy doing a small-scale project at a very reasonable price, I’m very happy with what came out of it. If you had been following the project, you would see how much love and time went into it. The guy even varnished all the dice himself to make them last longer! Anyway, the game basically involves the usual routine of rolling the dice and then having a limited number of rerolls to hopefully be able to make a set of fruit. If you get an appropriate set you can trade them for cards which score you points — and some of these cards can be stolen away by other players. Plus you can also miss out on some of your rerolls in order to pick up “fruit basket” cards, which can be used to change die rolls or do dirty tricks, adding some luck-mitigation to the game, which is always nice to see. We’ve played the game a couple of times now and had fun with it. Twelve sided dice can be pretty unpredictable, but there are generally quite a few choices for scoring and once you have some fruit basket cards, the game feels like you are actually making decisions, which is great. A good sign is that Miss B requested that we play again before she gave her verdict, and that we got to do the replay the very next day. Lately we seem to have been going through a bit of a spell of dice games, and this is a nice addition to the collection. (Incidentally, as this was done on a small production run, it may be hard to get hold of, but it may be worth checking out the Flippin’ Fruit website as there may be some stock available after they have fulfilled all the Kickstarter copies. 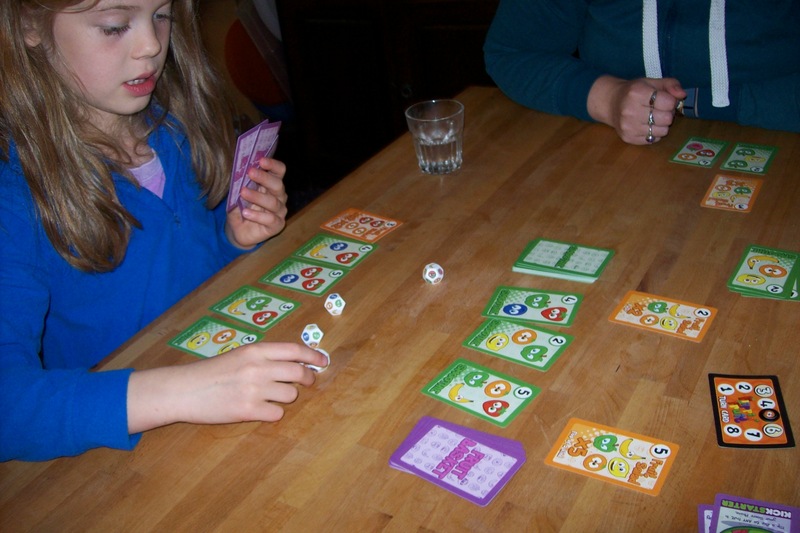 The game: Flippin’ Fruit (Andrew & Stephanie Platt), 2 to 4 players aged 8+. Dungeon Roll is a dice game about rolling dice in order to explore a dungeon, pretty much doing what it says on the tin. An adventurer has been selected to deal with that pesky goblin! Speaking of the tin, it’s worth noting the packaging. Dungeon Roll comes in a box shaped like a treasure chest, with a hinged lid. In fact, thanks to a friend (hi, Greg!) we have the special Kickstarter edition that is done up like a Mimic, a D&D monster that can take deceptive shapes, often like a treasure chest that attacks unwary adventurers. The box is actually used in the game: when you win treasure, you randomly draw counters from the chest, which is a lovely touch. So we have had the game for quite a while but, despite playing it a few times myself, I never got around to introducing it to Miss B until now. The game is a push-your-luck dice rolling fest with some lovely custom dice. Some of the dice are used to roll and find out which characters are in your adventuring party (fighters, thieves, clerics, that sort of stuff), then another player rolls the black dungeon dice to see what obstacles (and treasures) you encounter. You then allocate your adventurers to deal with the dungeon dice before deciding if you will continue to the next level, where even more dungeon dice will be rolled. All this is pretty good fun, but what makes the game is that everyone has a unique character taken from a small bundle of cards that came with the game. There are eight in the base game, plus an additional promo card that came with the Kickstarter set, and we also have an unopened booster pack of further characters that we will open as and when we get bored of the original set. Each character has a couple of abilities that can really shape how you approach the game and, while they don’t introduce any deep strategy, they do make you think a bit about how and when to use them. Plus, after you have earned some experience in the game you can flip the cards to get an advanced version of the character with even cooler powers. Miss B and I were delighted to find that four of the nine characters that we have are female. And it’s not “princess” or “witch” characters: the females include the Paladin and the Necromancer. This sort of thing is sure to make Miss B a happy girl. In play we had a ball. The whole thing of having the active player doing their thing while another player rolls the dungeon dice is a stroke of genius. It means that at any given time you have two players involved in the game play, and with two players that means all the game, all the time, which deals with a common problem of dice games (and not just dice games, if truth be told) where everyone just twiddles their thumbs waiting for their turn. There are plenty of subtleties about using abilities and treasures effectively, but I pointed out options to Miss B and she decided what she would do, steadily getting her head around the game. Frustrations were surprisingly few, and it must me said that the joy of rolling fistfuls of these gorgeous, colourful dice (they really are great) more than made up for any disappointments that did occur. We both like this game, and I think we’ll have fun working our way through the various characters. 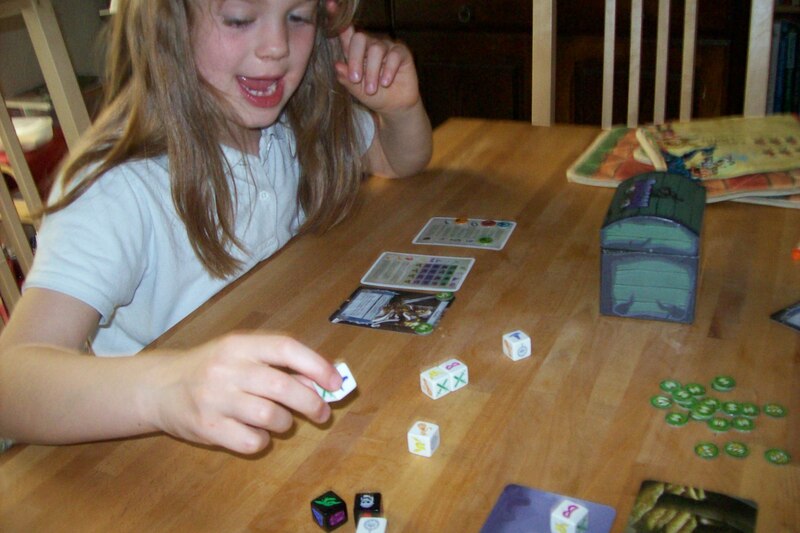 The game: Dungeon Roll (Tasty Minstrel Games), 1 to 4 players aged 8+. So this is Christmas, and what have we done…? Cool, I see something with feathers in the background!